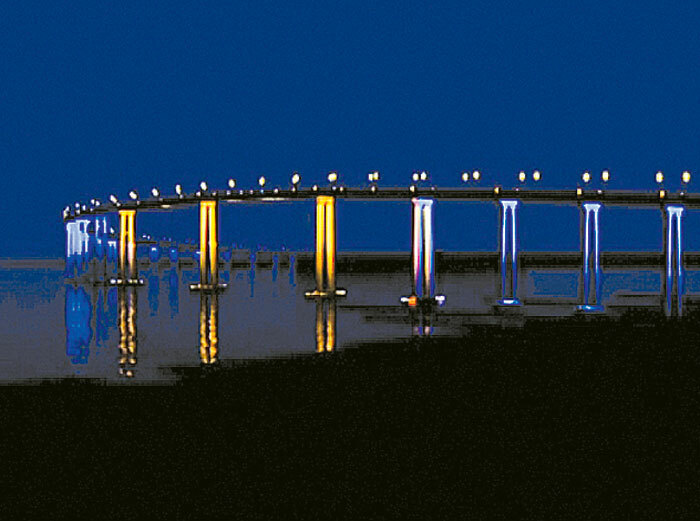 SAN DIEGO – In 2010, San Diego’s Board of Port Commissioners picked British artist Peter Fink’s design for artistically illuminating the San Diego-Coronado Bay Bridge. Once installed, the bridge’s new signature accent lighting would be viewable from all five of the Port of San Diego’s member cities, keeping San Diego Bay’s iconic structure visible day and night. But before the project can get under way, the port must identify where the $6 million to $8 million needed for the lighting project will come from. At the Nov. 13 Port Commission meeting, San Diego Public Arts curator Ivan Wise laid out a proposal for raising funds that starts with allotting $25,000 from the port to get the ball rolling in a nonprofit fund, and $50,000 to hire a professional advisor for the fundraising effort. Wise said he expects the money-raising effort to be a multi-pronged endeavor, including online donations, grants and in-kind services. In addition, businesses in the Port District must allocate one percent of their maintenance and restoration costs for public arts projects, and they can request that the port set aside those funds for the bridge project. The design was selected from more than 75 proposals in 2010, chosen on the basis that it would be capable of being viewed from all five port cities. The highly sophisticated lighting would operate in conjunction with the traffic density, intensifying and lessening its brightness based on the amount of traffic crossing the bridge at any given time. In addition, the lighting can be color-coded to coordinate appropriately with different days of the week or holidays. Port Commissioner Lee Burdick noted the importance of raising enough money to make sure the maintenance of the project is funded for years to come. “We don’t want an inadequate endowment, or else it could end up looking like a bad neon sign with some of the letters out,” she said, before turning her attention to the overall “positives” of the project. Commissioner Robert “Dukie” Valderrama and commission chairman Lou Smith stressed the importance of gaining extensive public input before moving forward with the project. Smith said more precise illustrations of how the lighting will look are needed to get a better idea of how the surrounding communities will be affected by the lighting project. According to the Fink design, the bridge’s pillars on the water will be illuminated, but exactly how far inland the pillar lighting will go is yet to be determined. Smith joked that if the pillars near the Mercado Apartments at 2001 Newton St. are lit, they won’t have to turn on their living room lights at night.